Ospreys and Wales flanker Dan Lydiate says Wales have "a massive bank of talent" to cope with back-row injury problems. Taulupe Faletau is likely to join Sam Warburton in missing the whole of the Six Nations. "With players being injured, we were the lucky ones selected (in November), and people like Josh Navidi had an awesome autumn," said Lydiate. "If everyone had been (fit), you don't know how selections would have gone." After a year out of international rugby through injury, Lydiate led Wales against Georgia, but saw Scarlets flanker Aaron Shingler start ahead of him against New Zealand and South Africa. Ospreys team-mate Justin Tipuric made just one brief replacement appearance in November because of a niggling thigh injury, while Warburton, Ross Moriarty, Ellis Jenkins, Ollie Griffiths and James Davies were all autumn absentees for Wales. Moriarty and Jenkins are due back in December and the uncapped Davies has returned for the Scarlets, but Griffiths faces another two-month lay-off. 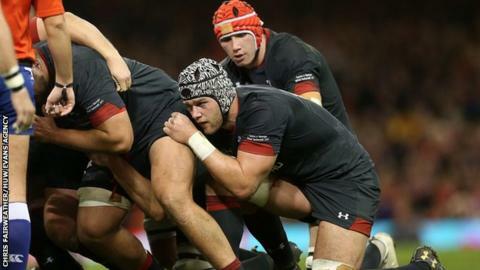 "When boys are getting the chances, they want to take it because they know how much everyone wants to be in that jersey," Lydiate told BBC Sport Wales. His own tally of 62 caps could have been far higher if it had not been for a number of lengthy lay-offs. When asked about his season's ambitions, Lydiate said: "I want to play for Wales, all players want to go to the World Cups and play in big tournaments, but for me it's just about trying to stay fit and improving my game." Lydiate believes that 2017 has been the Ospreys' worst year, after a poor finish to the 2016-17 season, then slipping to the bottom of their Pro14 conference and losing their two opening European Champions Cup matches. A dramatic 43-32 win at Northampton then prompted the dismissal of Saints' director of rugby Jim Mallinder. "Every game from now on is a vital game, because of where we are and where we have been in performances this season," he admitted ahead of the return against the Saints. "Up to now it's probably been the worst year as a region, and we're under no illusions. It's how we rectify that and how we turn things around as sharp as we can."